Vatican City, May 17, 2018 / 01:00 pm (CNA/EWTN News).- Pope Francis thanked Chile’s bishops for their “frank” dialogue during a 3-day Vatican meeting on the Chilean abuse scandals, and asked them to focus on serving abuse victims as they return to their dioceses and prepare to implement short and long term resolutions. “After these days of prayer and reflection I invite you to continue building a prophetic Church, which knows how to put what is important at the center: service to the Lord in the hungry, the prisoner, the migrant and the abused,” the pope said in a letter to Chilean bishops. Published May 17, the letter was given to each of the bishops by Pope Francis during their final meeting earlier that evening. “In light of these painful events regarding abuse – of minors, of power and of conscience – we have delved into the severity of these [abuses] as well as in the tragic consequences they have had, particularly for the victims,” he said. The three-day gathering between the pope and the 34 Chilean bishops began Tuesday with a day of prayer, and closed Thursday at 6:30 p.m., according to a Vatican communique. Pope Francis summoned the prelates to Rome last month following an in-depth investigation into abuse cover-up by Church hierarchy in Chile. The investigation was conducted by Maltese Archbishop Charles Scicluna, resulting in a 2,300 page report on the situation. The investigation was initially centered around Bishop Juan Barros of Osorno, who was appointed to the diocese in 2015 and who has been accused by at least one victim of covering up the abuses of Chilean priest Fernando Karadima. In 2011, Karadima was convicted by the Congregation for the Doctrine of Faith of abusing minors and sentenced to a life of prayer and solitude. Allegations were also made against three other bishops – Andrés Arteaga, Tomislav Koljatic and Horacio Valenzuela – whom Karadima’s victims accuse of also covering the abuser’s crimes. In the past, Francis had defended Barros, saying he had received no evidence of the bishop’s guilt, and called accusations against him “calumny” during a trip to Chile in January. However, after receiving Scicluna’s report, Francis apologized and asked to meet the bishops and more outspoken survivors in person. 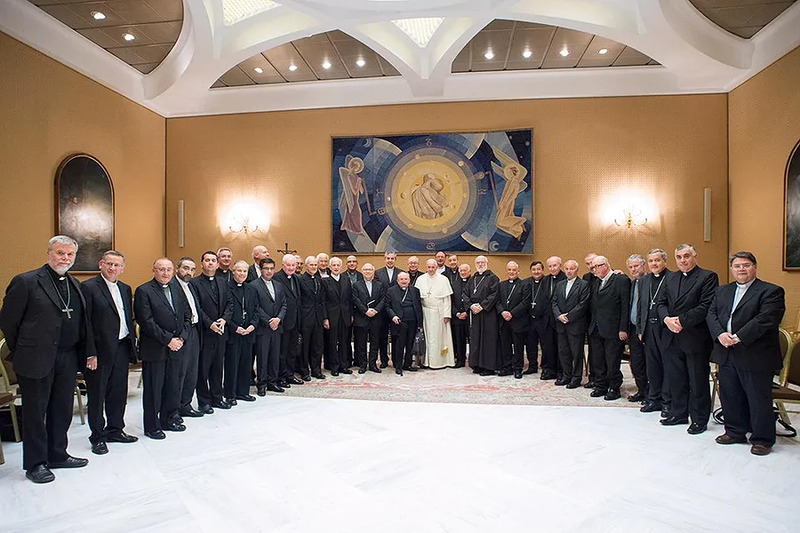 In comments to EWTN News Nightly, Bishop Juan Ignacio González of San Bernardo said the pope was very welcoming to each of them, and had voiced concern about the expenses of their trip, as some bishops come from poorer dioceses. After reflecting on the text they were given the first day, which Gonzalez said was an ecclesial text “on the mission that the Church in Chile has,” each of the bishops was invited in following sessions to share their thoughts about the text and what struck them. “The theme of the retreat is more of an ecclesial, theological theme which puts Christ in the center again, those things that we may have forgotten, the other things we have to continue doing,” he said, explaining that all of the bishops, including Barros, were able to speak. Naturally the pope will have decisions to make and there will be resolutions, but those will come later, the bishop said, adding that the time they had was one of discernment and returning to their heart of their mission, which is Christ. Panama City, Panama, Jan 26, 2019 / 07:54 am (CNA).- Pope Francis said Saturday that he recognized the weariness felt in the priesthood and in religious communities due to the sins that wound the Church today. Vatican City, May 18, 2017 / 05:33 am (CNA/EWTN News).- On Thursday Pope Francis received the credentials of six new ambassadors to the Holy See, telling them to work for the common good and support peace efforts that lessen tensions given the complexity of the global climate. Francis spoke to ambassadors Ms. Zhanar Aitzhan of Kazakhstan; Ms. Aichetou Mint M’Haiham of Mauritania; Mr. Ramesh Prasad Khanal of Nepal; Mr. Boubacar Boureima of Niger; Mr. Daffa-Alla Elhag Ali Osman of Sudan and Mr. Colin Michael Connelly of Trinidad and Tobago. He asked them to convey his respect to their respective heads of State, and offered a special greeting to M’Haiham, who is Mauritania’s first ambassador to the Holy See. These authorities are responsible for the common good, “yet they lack the means necessary to moderate the disproportionate appetites of the few,” he said, noting that there seems to be an increasing impulse toward violence. Turning to the task the ambassadors themselves will face, Francis said the response to these “distortions” and the risks they pose to promoting peace must be the creation of “a responsible economic and financial system” that is responsive to the needs of both individuals and their communities. “Those who befoul the image of God in this way need to be confronted by a concerted commitment to demonstrating that those who honor God’s name save lives, not take them,” he said. If we move more decisively in the direction of peace, mercy and compassion rather than division, war and indifference, then “the cause of peace and justice – the conditions of a balanced development for all – will make tangible progress,” he said. 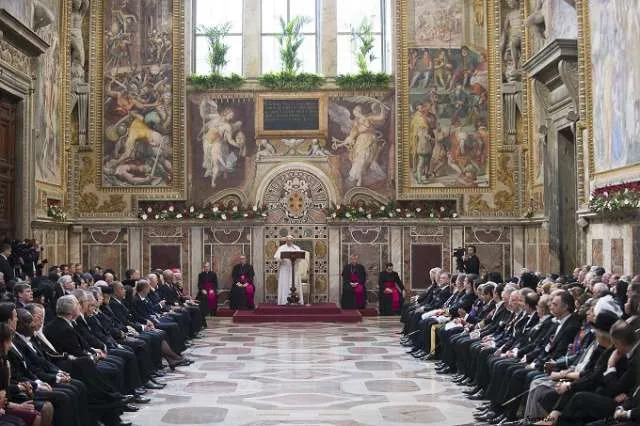 Francis then offered his personal greetings to the Catholic population in each of the six countries represented by the ambassadors, and assured the diplomats of the constant support of the Roman Curia in fulfilling their duties.